Most likely you have a favorite holiday tradition or two . . . something you treasure each year as the season comes around again. Whether it’s placing a special ornament on the tree, watching a favorite holiday movie together, visiting a certain jolly fellow (in our family, the Northpark Santa IS the real Santa), or doing a familiar holiday activity together, you have a tradition you never want to miss. My sister and I would always write long, detailed letters to Santa each year; it was our tradition together in fact. My parents would then take us downtown to Titches (yes, I’m that old), to visit with St. Nick to share our letters. I would never tell my parents what I wrote in my letter even though they would do any number of things to make me “spill it” (Momma says I’m stubborn that way; go figure?!). It took me a while to pin down exactly why they wanted to know this personal information. 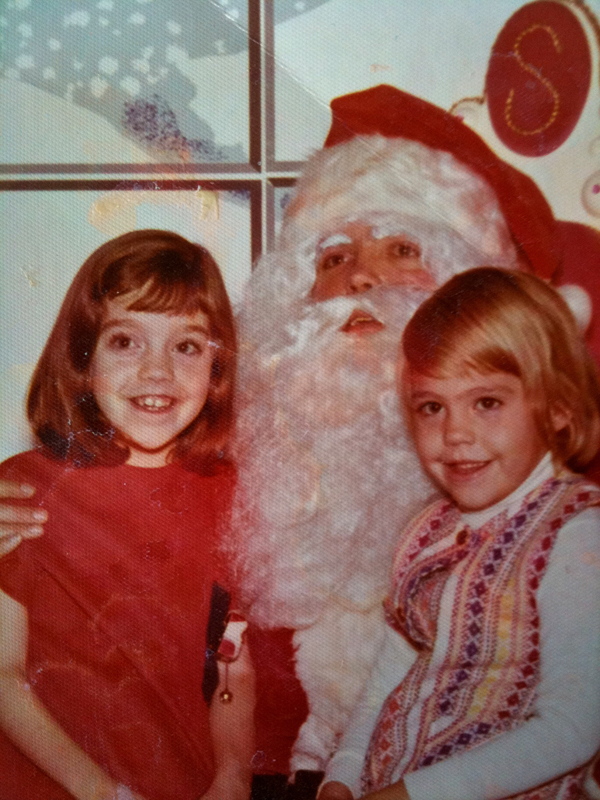 The picture is me in third grade (with Becky) talking with Santa. Notice I already have a “teachery” stocking pin dangling from my shirt (because it’s all about the accessories, you know). Writing our letters was a tradition we shared together. Today, we still write our shopping lists (using email or text) because great minds (like ours) think alike and we’ve also been known to buy the same present for a family member. Talking, planning, and writing with my sister are traditions during the holidays (and everyday) I never want to miss! In past newsletters each December, you may have read other personal reflections of mine on favorite holiday family traditions. This leads me to our Christmas Question of the Day: What are your favorite family Christmas or holiday traditions? In whatever way your family chooses to define the holiday season, take time to reflect with your learner on special traditions. If you don’t have a favorite tradition, here’s hoping you start one this year! Note: Speaking of Santa pictures, thanks to the volunteers who assisted today during PTO’s Pictures with Santa at Miller. Thanks, Santa, for stopping by to visit with us!